This is a special allegory for fathers to read to their daughters. 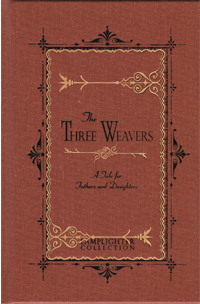 As the story goes, once upon a time there were three weavers, and to each was born a daughter. The "watcher of weavers" prophesied, "A royal prince shall seek to wed thy child," but she must weave a mantle for the prince that will be fair to look upon with rich cloth of gold, and it must fit him as perfectly as the falcon's feathers fit the falcon. Each father is responsible to teach his daughter how to prepare for her prince. When should he begin? The father's approach, coupled with his daughter's cooperation, will decide the fate of her future. Very Good. I Definitely Recommend it! From HonorYourParents of Centerville, Massachusetts on 3/27/2015 . I love it! The only thing I didn't like about it, was the size of the words in the book. I was expecting the words to be as small as the other books I've gotten, but they were surprisingly bigger. From Anonymous of Ypsilanti, Michigan on 8/11/2014 . I love all the Lamplighter books our family has read. This one is so short and sweet. And though every man, woman and child ought to read it, this book has a wonderful message for Dads who are raising daughters.